So, I had quite a few things come out this year, and they are all eligible for award consideration. Cat Rambo was encouraging authors to do this, so here I go! (HWA for sure, as well as SFWA, etc.) The short stories were for pro pay, so those markets are definitely eligible. If you are a member of HWA, SFWA or any other organization that nominates for awards and you would like a PDF of any of this work, let me know, at wickerkat@aol.com or richardgamut@gmail.com. Description: Living alone in the dusty apartment where he grew up, Ray Nelson is a mystery to his neighbors and an unbeatable foe to the brutal men he fights in the ring for money. But a life defined by sinister secrets doesn’t stop Ray from trying to do the right thing for his dangerously high-flying sister. Or for Natalie, the young girl living next door. As a sadistic murderer’s ominous white van trolls for young victims throughout the Windy City, Ray is determined to protect Natalie from both predators and a bleak future. When she sees a bruised and beaten Ray return from late-night fights, Natalie spots a kindred spirit. Still, she cannot imagine the darkness just beneath, or what’s hidden in the rooms he calls home. Now, as the horrors of his own past creep back to life with a twisted vengeance, Ray may not even be able to save himself. Description: In the third short story collection by Richard Thomas, Tribulations, the stories cover a wide range of dark fiction—from fantasy, science fiction and horror, to magical realism, neo-noir, and transgressive fiction. The common thread that weaves these tragic tales together is suffering and sorrow, and the ways we emerge from such heartbreak stronger, more appreciative of what we have left—a spark of hope enough to guide us though the valley of death. Fireflies and wolves, ghosts and golems, tentacled beasts and demonic spirits–these psychological thrillers will hypnotize you as they slide the blade between your ribs, up close and personal, whispering in your ear as you gasp and pull them closer. Tribulations includes 25 short stories–including two that were long-listed for Best Horror of the Year. There are also five original full-page illustrations by Luke Spooner. Description: Across four different districts of a city that has torn itself to shreds, four different interweaving tales (each written by a different author) play out. In “Four Corners,” a morally dubious banker must keep his employer happy at any cost. The next story, “Punhos Sagrados,” concerns a boxer who finds himself torn between honor and the woman he loves. “Golden Geese” follows a hardened criminal with a terrifying condition who must come to terms with the life he’s led. Finally, “Jamais Vu” provides a stunning denouement as a man searches endlessly for his missing daughter, a task which is complicated by a peculiar condition: his inability to recognize faces. Told in rugged, bare-knuckled prose, The Soul Standard is a nonstop thrill-ride down the darkened avenues and through the shadowed alleys of a nightmare town. MY NOVELLA “Golden Geese” is about a man living in the outskirts, trying to forget the dark deeds he has done, as the consequences of his actions close in around him, one final act of redemption his only way to survive. Gutted Description: From Bram Stoker Award-nominated publisher, Crystal Lake Publishing, and the editing duo who brought you the best-selling and critically acclaimed small-town Lovecraftian horror anthology Shadows Over Main Street, comes Gutted: Beautiful Horror Stories–a disturbing journey into the beauty that rests inside the very heart of darkness. Gutted: Beautiful Horror Stories features the most celebrated voices in dark fiction, as well as a number of exciting new talents: Clive Barker, Neil Gaiman, Ramsey Campbell, Paul Tremblay, John F.D. Taff, Lisa Mannetti, Damien Angelica Walters, Josh Malerman, Christopher Coake, Mercedes M. Yardley, Brian Kirk, Stephanie M. Wytovich, Amanda Gowin, Richard Thomas, Maria Alexander and Kevin Lucia. Edited by Doug Murano and D. Alexander Ward. MY STORY “Repent” is about a father, a bad man, and what he is willing to do in order to redeem himself and save his son. Chiral Mad 3 Description: The third act in the critically-acclaimed series by Written Backwards, is a symmetrically-structured anthology of psychological horror by Bram Stoker Award nominated editor Michael Bailey, whose previous anthologies include The Library of the Dead, Qualia Nous and Pellucid Lunacy. 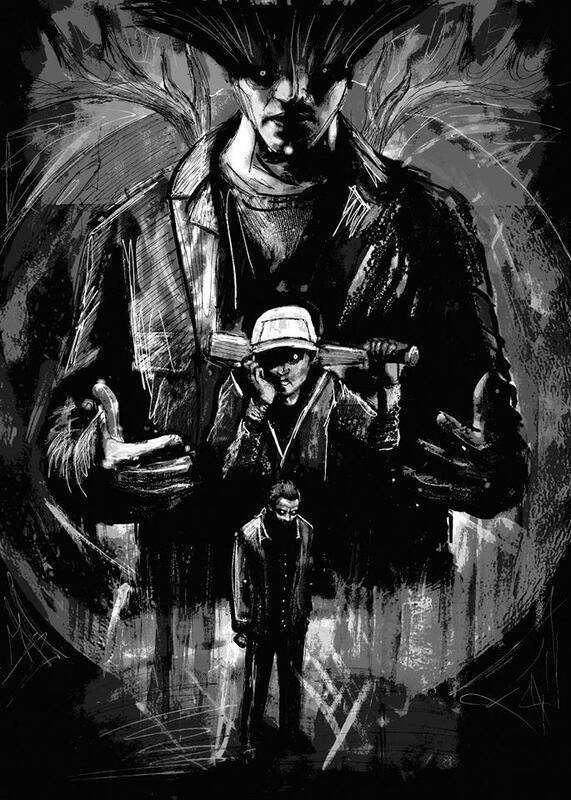 The anthology contains 45 illustrations by Glenn Chadbourne, over 20 stories by the likes of Stephen King, Jack Ketchum, Ramsey Campbell, Gary A. Braunbeck, Mort Castle, Josh Malerman, Scott Edelman, Richard Thomas, Richard Chizmar and Gene O’Neill, and with 20 intertwined poems by the likes of Elizabeth Massie, Marge Simon, Bruce Boston, Erik T. Johnson, Stephanie M. Wytovich, and also includes an introduction by the extraordinary Chuck Palahniuk. MY STORY “The Offering on the Hill” is a bit of a Dark Tower homage, about a man wandering in a post-apocalyptic setting trying to find his wife and daughter. The Soul Standard (Dzanc Books) is OUT TODAY! How many years has it been since we started this project? I think at least five, my section, Golden Geese, written at the Writers in the Heartland writing residency that I was awarded back in 2011. The Soul Standard (Dzanc Books) is a dark journey—four novellas written by four authors (myself, Nik Korpon, Caleb Ross and Axel Taiari) across for seasons in four different parts of The City. Think Sin City meets Memento. It was an honor to work on this with Nik, Caleb, and Axel—three very talented authors. So if you enjoy my writing, and that of my esteemed peers (Nik is blowing up, with several books out, a new contract with Angry Robot books just announced and Axel Taiari one of the authors in the anthology I edited, Exigencies) then pick this up today. The eBook for Tribulations is now out with Cemetery Dance. Thrilled that I can finally announce the eBook of my third short story collection Tribulations is out now with Cemetery Dance Publications. Long time fan of CD, bought so many Stephen King titles from them over the years. I’ve previously published a short story, “Stillness” in Shivers VI (alongside Stephen King and Peter Straub) as well as “Chasing Ghosts” in Cemetery Dance #72 (also alongside Stephen King—it’s like the dude is stalking me). Exigencies is Nominated for a Shirley Jackson Award! Honored to announce that Exigencies has been nominated for a Shirley Jackson Award. This is the first Dark House Press anthology of entirely new fiction, so it means a lot. ALSO, Letitia Trent has been nominated for her story, “Wilderness,” which kicks off this book. (That excellent story was also selected for Best Horror of the Year, Volume Eight.) Congratulations to all of the authors in this anthology, as well as all of the other nominees. Very exciting. Honored.